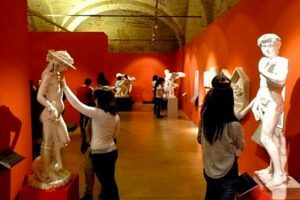 The Omero Tactile Museum was founded by two blind persons and the only one of its kind in Italy, is an experience that we suggest you to live. The Omero Tactile Museum is one of the few museums in the world where you can freely touch all the artworks inside. Along the way you will meet in chronological order copies of famous sculptures: from the Greek and Roman periods to the original works of contemporary art. At the entrance you will be given a bandage and from there you will be guided by the hand of your companion through the halls of the museum; stopping in front of a work, you will have the chance to touch the art with the hands and to study the form, size and position of the works concerned … you will be amazed to discover how the other senses come in handy when there is no view. The Omero Tactile Museum is located inside the Mole Vanvitelliana and the entrance is free. Summer Timetable: July 1 – August 31: Tuesday-Wendnesday-Thursday-Saturday 17-20; Friday 17-20; Sunday and August 15 10 – 13 and 17 – 20. Winter Timetable: 1 September-30 June: Tuesday-Saturday 16-19; Sundays and holidays from 10 to 13 and 16-19. Morning: open by reservation for groups and schools. Closed: Monday, December 31 and 25, May 1, 15 August.